Endorsing the call of the Sindh High Court Bar Association and Karachi Bar Association to celebrate the Iftikhar Day on January 31, 2008, activists of the Human Rights Commission of Pakistan and representatives of several civil society organizations gathered outside the Karachi Press Club, with the portraits of Chief Justice Iftikahr Chaudhry, and expressed solidarity with the lawyers’ movement for the freedom of justice in Pakistan. Participants chanted anti-government slogans and held banners and placards demanding restoration of deposed judges, the constitution and revival of human rights in Pakistan. 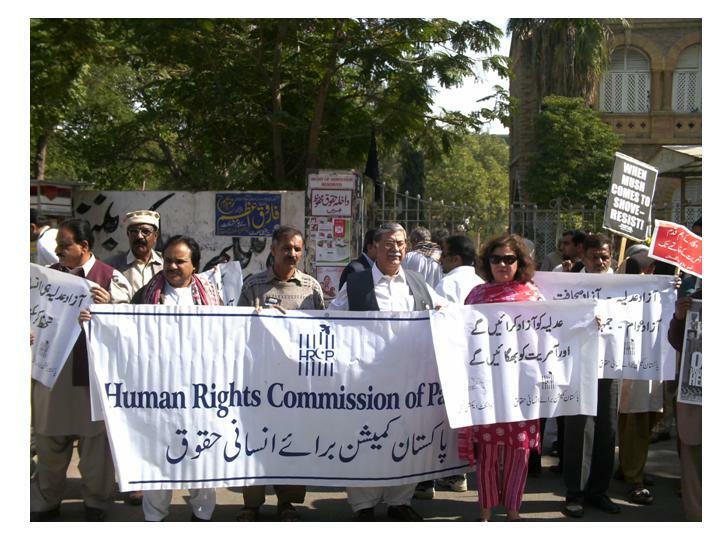 Later on a rally of hundreds of lawyers, led by Mr. Munir A. Malik, Mr. Rasheed A. Rizvi and Mr. Iqbal Haider, Secretary General of the Human Rights Commission of Pakistan, also joined the demonstrators at Karachi Press Club. · Mr. Iftikhar Chaudhry, Chief Justice of Supreme Court of Pakistan and other judges of Supreme Court and high courts should immediately be re-instated. Karachi: In a statement issued to the press Mr. Iqbal Haider, Secretary General, Human Rights Commission of Pakistan (HRCP) strongly denounces Musharraf’s impudent comments about a senior journalist. Mr. Haider said that it’s an outrageous and unpardonable yet another attack on freedom of expression and freedom of press. Parveez Musharraf must offer unconditional apology for having used offensive and abusive language and for inciting the people to beat him up. The accusation of Parveez Musharraf against Mr. Ziauddin that he destroys country’s image outside the country is completely baseless and the undeniable truth is that it is the policies and acts of none other than Parveez Musharraf which are the real cause for causing irreparable harm to our national interest and image of our country. To accuse a patriot like Ziauddin as an anti-state element is an intolerable attack which further defames our country because this attack is coming from the person who styles himself as the President. In his attempt to abuse and attack Mr. Ziauddin, Mr. Musharraf is only inviting ridicule and condemnation from all democratic, civilized and human right activists not only in Pakistan but also all over the world. Mr. Haider said that such remarks shows that President Musharraf, after taking unconstitutional and arbitrary actions including the dismissal of 55 senior judges and also resorting to attacks on demonstrations is now attempting to extend his attack also against persons who express their dissent from abroad. The arm of repression that grips the entire democratic and rule of law system within Pakistan is now extending even to people outside. Mr. Haider said that HRCP reiterates its warnings to the government to restrain from committing such ugly attempts to restrict media freedoms and these attempts can have only the most negative impact, while also proving the government’s claims of guaranteeing free expression are nothing but another among the growing litany of lies routinely told to the people of Pakistan. HRCP notes that under the present military regime, the right to free expression is coming under severe attack. Despite the claims of leaders regarding media freedoms, a growing number of journalists have faced pressure, often from intelligence agencies or military personnel, in an attempt to coerce them into compliance with the official line. Several are missing, or have been murdered, according to reports from the NWFP. HRCP believes this policy of repression is a part of the dangerous strategy of secrecy, aimed at deluding citizens and international audiences. Silencing independent voices can only add to problems that already exist within the federation. 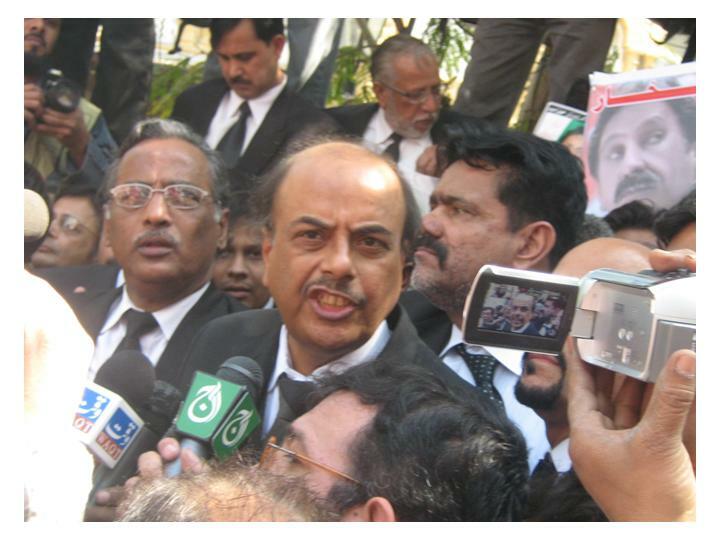 Mr. Justice (R) Nasir Aslam Zahid of Legal Relief would address a press conference at Karachi Press Club on Monday, January 28, 2008 at 04:00 pm. Kindly do make it convenient to attend the press conference. Lahore, January 23: While welcoming the lifting of the cable-ban on the Geo News the Human Rights Commission of Pakistan (HRCP) has called for the removal of all curbs on the media and an end to the climate of fear in which media persons are working. The Human Rights Commission of Pakistan (HRCP) is relieved to learn that the cable-ban on the Geo news and sports channels has been lifted. The ban was unjustified and it violated not only the broadcaster’s freedom of expression but also the people’s freedom of information, besides causing hardship to thousands of journalists and workers. It seems their suffering might well have been reduced if President Musharraf’s trip to Brussels had been scheduled earlier. Now that its rancour against the media appears to be subsiding the government should be able to realize the need for withdrawing all restrictions that prevent the media from serving the people with truthful accounts of events and an atmosphere of free debate. In June last year the government had promised to withdraw the Pemra (Amendment) Ordinance against which media organizations had strongly protected. That pledge remained unredeemed and on November 3 the harsh measure was reintroduced. At the same time the Presses, Newspapers and News Agencies Ordinance (earlier called Press and Publication Ordinance) was amended so as to increase the threat of executive’s punitive action. Subequally came the ordinance on cyber offences which is causing considerable concern to the media people. All these restrictive measures have created a climate of fear for journalists and unless this climate is ended a basic condition of free elections will not be met. Neither the media will be able to grow, nor will the people secure their right to know, if the media remains subject to the whim and caprice of Pemra or, worse, a single individual. Karachi: While strongly condemning the dastardly attack on Ms. Benazir Bhutto and condoling her assassination, in its meeting held in Karachi, the Sindh Council of the Human Rights Commission of Pakistan took serious notice of the provocative election campaign of PML-Q through advertisement in the leading newspapers of Pakistan and warned the Government of Pakistan that such advertisements would only lead to ethnic violence in the country. HRCP Sindh Council considered it as a serious criminal act on the part of PML-Q which is not only against the code of conduct of the Election Commission of Pakistan but also provokes people to resort to violence on ethnic and regional basis. HRCP Sindh Council called upon the Election Commission of Pakistan to take notice of such advertisements which appeared recently in the media. Election Commission of Pakistan must also take notice of such provocation. Karachi: In a joint statement issued to the press Mr. Iqbal Haider, Secretary General, Human Rights Commission of Pakistan (HRCP) and Ms. Zohra Yusuf, Vice Chairperson, HRCP strongly condemned the police violence against peaceful demonstrators, gathered outside the residence of Justice (R) Rana Bhagwandas, to launch their protest against his undeclared house-arrest. It was shocking to note that, violating all norms of decency, male policemen misbehaved with women demonstrators, baton-charged male activists and arrested 08 of them. On the evening of January 13, 2008, protesters belonging to civil society groups gathered outside the residence of Justice (R) Rana Bhagwandas situated in Block-A, in the Clifton police’s jurisdiction and started lighting candles to symbolize their protest. In the meantime, a heavy contingent of police reached the spot. Suddenly, all the streetlights were switched off and police arrested 8 civil society activists, including Mr. Kamran Noorani, Mr. Salahuddin Ahmed, Mr. Naveed Noshad, Mr. Danish, Mr. Muhammad Faisal, Mr. Syed Mustafa Rizvi, Mr. Zafar Aslam and Mr. Asad Umar. They were thrown into the waiting police mobile vans after a brief scuffle with women protesters. They were taken to Darakhshan Police Station while an FIR # 13 / 08 was registered in Clifton Police Station U/S 147 and 148. After five hours of detention, all were released on bail on personal bonds. HRCP holds the provincial authorities fully responsible for the brutal police action against peaceful demonstrators. HRCP demands that all politically motivated cases be withdrawn, against the activists of civil society who were exercising a democratic right through peaceful means.